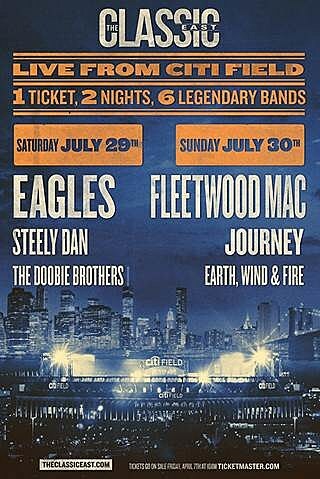 As you may know, Fleetwood Mac and The Eagles are throwing two-day festivals in NYC and LA this summer, Classic East and Classic West. 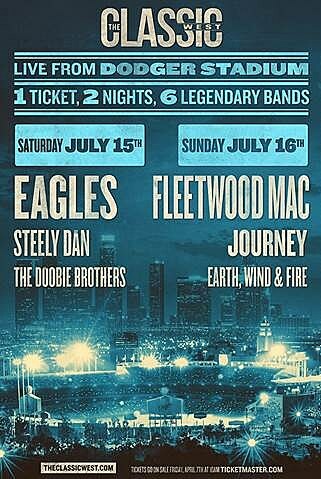 The fests happen July 15-16 at Dodger Stadium in LA and July 29-30 at Citi Field in NYC, and the lineups include The Doobie Brothers and Steely Dan on day 1 with The Eagles, and Journey and Earth Wind & Fire on day 2 with Fleetwood Mac. In related news, Fleetwood Mac are releasing Alternate Mirage on Record Store Day. Stevie Nicks is currently on tour with The Pretenders, and about to play two NY/NJ shows next week. Steely Dan members Jon Herrington and Jim Beard have a NYC show together on June 21 at Iridium (tickets).